A battling innings of 85 from Lancashire captain Steven Croft was not enough to prevent his side following-on against Kent on day three of the LV= County Championship Division Two fixture at Canterbury. Despite Croft’s four-hour vigil, an excellent all-round performance in the field saw Kent dismiss Lancashire for 259, 311 runs short of Kent’s first innings total of 570-8 declared. 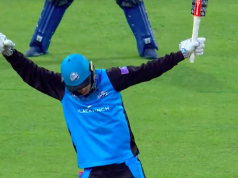 Kent skipper Sam Northeast had no hesitation in asking the visitors to bat again as Kent looked to secure a first Championship win of the season at the Spitfire Ground. Karl Brown and Alviro Petersen saw their last action of the match after being dismissed cheaply in the second innings, leaving Lancashire 47-2 at the close of play. The visitors have plenty of work to do tomorrow if they are to escape with a draw and secure the remaining two points they require to gain promotion during this fixture. 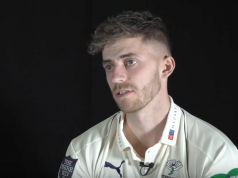 Kent’s bowlers made the most of helpful overhead conditions and the scoreboard pressure piled on by their batsmen during the first two days of the game – a rare treat this season – with a highly disciplined performance that saw the wickets shared around. Unlike their Lancastrian counterparts, they were well-supported in the field as catches were taken with a minimum of fuss. Darren Stevens was the man to make the initial breakthrough with a double-wicket maiden in the seventh over of the day. England Under-19 skipper Haseeb Hameed was the first man to go when, on 14, he edged an outswinger to James Tredwell at second slip, who took an athletic catch low-down to his left. Two-balls later, Petersen, stuck in his crease, was rapped on the pads and given out LBW for a duck to leave Lancashire struggling at 46-2. Ashwell Prince looked a shadow of the self that has scored over thirteen-hundred Championship runs this season as he scratched his way to 17, Kent’s seamers barely giving him a loose delivery. He was caught behind by Ryan Davies after edging a rising delivery from Matt Hunn that was too close to attempt to cut. Hunn has now taken Prince’s wickets in all three of the Championship innings in which he has bowled to the South African. At the other end, Karl Brown survived a number of enthusiastic appeals from an increasingly excitable Kent side as he grafted his way to 53 from 100 balls. His hard-work was undone, however, when, during Matt Coles’s first over of his second spell of the morning, he drove loosely outside the off-stump and edged behind. Ben Harmison, at third-slip, eventually took the catch after a brief juggling-act. Coles struck again in his next over when Alex Davies couldn’t get his bat out of the way of a lifting delivery and sent the ball ricocheting into his stumps. Lunch followed soon after, Lancashire having limped to 104-5 at the break. A 91-run partnership between Croft and Jordan Clark halted the clatter of wickets for much of the afternoon session. Both men were solid in defence and efficient in picking up boundaries square of the wicket as the odd long-hop crept into Kent’s repertoire. The cut shot was particularly productive for Croft, although it was a violent pull off Callum Haggett that rocketed to the mid-wicket boundary to take him to 47 that was most impressive. His fifty soon followed, but not before Clark had departed. Clark had driven pleasantly off the back foot and attacked anything wide with controlled aggression during his 83-ball innings of 44, but his penchant for playing back ultimately cost him his wicket as Haggett found the shoulder of the bat with a rising-delivery and Tredwell took his second catch in the slips. Tom Bailey was clean bowled by Tredwell soon after, with Lancashire reaching tea seven down for 233 and still 187 runs away from saving the follow-on. Glen Chapple and Simon Kerrigan offered little support to Croft after the interval, both departing cheaply. Croft was the last man to go 15 short of a century when he was trapped in-front by Coles, giving the seamer his third wicket of the innings and his sixtieth of the campaign. Coles struck again two balls later when Brown went leg-before in the first over of Lancashire’s second dig. Tredwell rounded off Kent’s day when he bowled Petersen with what turned out to be the final ball before the close.